The Superman Fan Podcast: Episode #295 Part I: Superman Comic Book Cover Dated January 1963: Superman #158! Episode #295 Part I: Superman Comic Book Cover Dated January 1963: Superman #158! Download Episode 295 Part I! 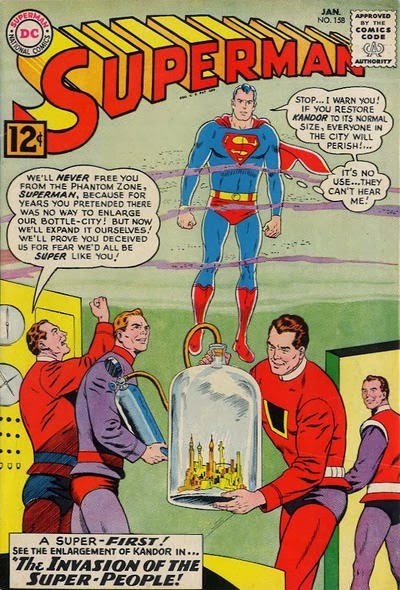 SUPERMAN 158, January 1963, was published on November 8, 1962. It contained 32 pages for the cover price of 12¢. The editor was Mort Weisinger and the cover was pencilled by Curt Swan and inked by George Klein, who were the art team for this issue's 3-part story. -SUPERMAN IN KANDOR (26 pgs. ), was written by Edmond Hamilton. This story has been reprinted in, SUPERMAN: THE BOTTLE CITY OF KANDOR, SHOWCASE PRESENTS: SUPERMAN vol. IV and SUPERMAN'S PAL JIMMY OLSEN 140, August/September 1971, published on June 3, 1971 and containing 64 pages for the cover price of 35¢. This back issue is where I first read this story. Also highlighted in this episode are the ads and other features in this issue, including the METROPOLIS MAILBAG letter column. Next Episode: SUPERMAN COMIC BOOK COVER DATED JANUARY 1963 PART II: SUPERMAN ANNUAL 6! In 2 Weeks: SUPERMAN COMIC BOOK COVER DATED JANUARY 1963 PART III: ACTION COMICS 296! In 3 Weeks: MEGACON 2014 PREVIEW! In 1 Month: SUPERMAN FAMILY COMIC BOOK COVER DATED MARCH 1960 PART I: SUPERMAN'S PAL JIMMY OLSEN 43! In 5 Weeks: SUPERMAN FAMILY COMIC BOOK COVER DATED MARCH 1960 PART II: WORLD'S FINEST COMICS 108! - The SUPERMAN WEBRING of websites, and- The SUPERMAN PODCAST NETWORK at http://supermanpodcastnetwork !